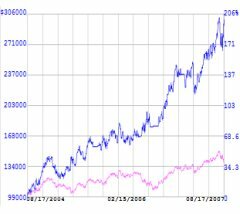 Backtesting: We see how an investment can grow to three times its size between 2004 and 2007 in the chart below, just by making 1 to 2 roundtrip trades per year in RYDEX funds at times recommended by TradeWHEN. Not only has this worked, it is easy to do. Our custom-designed computer software system analyzes the stock market each evening, then makes any recommendations by evening. You check and follow the instructions for the following trading day. Typically, just one to two roundtrip trades each year are required. The financial markets are comprised of people. The movement of prices in the stock market is nothing more or less than the sum total of the decisions of all the people in the process of investing or selling at any given moment. This certainly sounds like an impossible job - people can be very unpredictable. However, when you stop looking at individual people, and pay attention to the behavior of the crowd instead, it becomes a very different task - the same sort of job that advertisers and politicians specialize in. There are unique difficulties, to be sure, but human behavior does have predictable tendencies. Not everything that happens on a stock market chart is predictable. Some price movement is random. Other times, price movements can be triggered by news events, new product launches, management changes, or scandals. Computerized timing systems work by finding common patterns in the data that statistically correlate with particular price movements. You will find that systems like ours work best with indexes or funds (ETFs or mutual funds) because in a large grouping of stocks, individual fluctuations (caused by what may be happening at that particular company) are minimized, and conversely, statistical trends common to all stocks add together and are emphasized. It's these common trends that the computer trades on. The links below take you to other pages on our site that help to explain what the TradeWHEN system is, and how it works.